Where are my keys? Did I fill out the permission slip for my child’s field trip? What date was that event? Why can I never find what I’m looking for? Over the years, I have asked these and other questions related to my papers, my time, and my possessions in general. It’s frustrating and overwhelming when we don’t feel like we have a grip on what’s going on in our lives. However, with all the information we receive on a daily even hourly basis it’s hard to keep up with all the things we need to know. And what about all those thoughts you have at random times of things you know you need to do? Eventually, our minds get overloaded and things begin to slip through the cracks. Am I right? Surely I’m not the only one who has experienced this. Several years ago I was introduced to the concept of mind organization. Mind organization is a huge part of my time management system now. What is mind organization? Well, simply put, it is a system where you capture every piece of information that comes into your life that you need to act on in a place where you will trust that you will see that information again and will act on it in a timely manner. For instance, I just went through a pile of papers on my kitchen island that included things like a save the date card for an upcoming wedding, a magazine renewal form, and my daughter’s shot records that I need to make sure are up to date. In the past, I have just piled these papers up on my counter in the kitchen or placed them in a wall pocket in my laundry room. With these kinds of “storage” solutions, I found myself always scrambling to find a form I needed. Or, I often forgot about certain items in the pile because I didn’t always look through it. Now I have an organized system that allows me to capture all that information in one place in an organized fashion. I look at it every week during my weekly review and nothing gets overlooked. I’ll go into more detail on how this system works later. 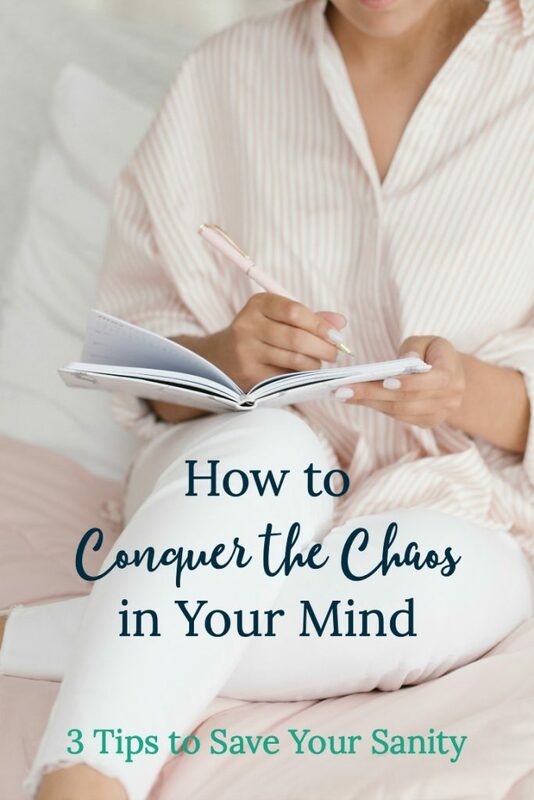 However, for today, I want to share three simple strategies you can implement today to help you get things off your mind and into a place where you will remember to act on them. On Friday afternoons or Saturday mornings I sit down with my planner and plan out the week ahead. Part of this process includes assessing what needs to be on my to-do list for the week. I suggest you get a letter tray, a basket, or a box to hold everything you need to deal with. This includes items from the regular mail, email printouts, notecard or notepad papers you’ve added in as you’ve thought about to-dos (see next item), magazines or catalogs to look through, and anything else you can think of that will need your attention in the near future. Collect these items throughout the week. Then sometime over the weekend, even Friday afternoon, go through your collection of items and see what needs to be done in the week ahead. Items that can wait until later can stay in your box until the next weekly review. The items you’ve determined that need to get done in the next week will make up your to-do list. This really helps to streamline what gets done in a week’s time. If you look at your calendar and notice you have lots of other things going on, then it may require you to rethink some of the items you plan to do. The key to success with the weekly review and to make sure you don’t miss anything is to commit to doing every week. On occasion, you may have to miss it because life happens. However, it should be your regular practice to do a review every week. I know this seems elementary but it’s SO helpful to write things down as soon as you think of them. I keep notepads handy all around my house, in my car, and in my purse. This way when I think of something I need to do I can just write it down. Then I take that sheet of paper and place it in the basket I use for my weekly review if it’s something that does not have to be done right away. That way it’s in the stack to be reviewed at the end of the week and can be put into the right place so I won’t forget about it. Having these notepads accessible wherever I am has totally saved my sanity! There are so many places where we get our information from these days. It comes in the snail mail, through email, voicemails, and even messages through social media. It is hard to check multiple places to make sure we are not missing out on any important to-dos. I advise that you narrow down the options people have to be able to contact you with information. Say you want to keep your information flow to regular mail, email, and texts. When someone sends you a message through social media, reply back quickly letting them know where to send the information. When you let them know you won’t act on their information until they send it to you in a way you can process, they’ll begin to understand and hopefully will start using the method of communication you prefer. Eventually, they should quit contacting you through social media. I hope these three tips will help you get things off your mind and start getting things done. What are your favorite ways to keep up with your tasks?